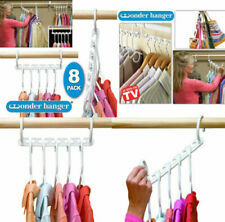 PULL OUT WARDROBE HANGER. ROD WITH BALLS. MOUNTED ON SLIDE RAIL. - W = 65 mm. - H = 99 mm. - D = 448 mm. You are bidding on huggable hangers pants clips. Here are the sets I have 1. 24 EA. Dark brown clips 2. 24 EA. Dark brown clips, 6 are missing small inserts on top of clip. Still completely functional 3. 30 EA. Dark brown clips 4. 20 EA. Light brown clips 5. 20 EA. Light brown clips When you make your offer, please specify which set # you are wanting. Thank you. 4Pcs Adjustable Clapboard Drawer Organizer Divider Partition Storage Wardrobe Plastic Clapboard. - Whether it is a desk drawer, closet drawers, dresser or trunk space, etc. - Do not worry, creative drawer partitions to help you solve the problem. POSSIBLY MADE FROM PINE. 14” LONG AND 4.5" WIDE. AGE OR MAKER. 💥Azar 12-Pocket Bifold Wall Mount Brochure Holder💥. Azar's Multi-Tier Wall Mount. Azar's Multi-Tier Modular Brochure Holders are very stylish and ideal for displaying brochures, pamphlets, flyers or magazines in small or crowded locations on your counter, shelf and tabletop. 1 X Drawer Clapboard. 18 Partition Parts approx. Each Piece Size:approx.36x6.7x4.5cm(LxWxH). Underground Wire Splicing. 15 Ton Dies. "U" Style 12 Ton Dies. Blackburn C ompression Connectors. S emi Tension Sleeves. " Kearney" Style Dies. "W" Style 6 Ton Dies. Service Wedges. Disney's Frozen 13-Pocket Hanging Closet Shoe Organizer with Elsa Anna. See all photos. This cover won’t cover up the view of everything on the shelves, with its nice clear front. Covers & protects shelving & other furniture. Great for storage shelfs, cabinets, wardrobe. Clear front flap allows easy view of all contents. Available in white. In other words, make sure you know what you are buying. 2 Each, New never installed. Sort out your wardrobe with a compact, organized pile system. -Lie clothing flat on top of the mat, fold over side sections then the bottom section - you're done. -Easy step folding process. -Fold clothes into one neat, wrinkle-free size. PACE SAVING: The hanging closet has 6 shelves that fully utilize the space in your wardrobe, coatroom or trailer, a wonderful plan for your clothes and accessory storage.